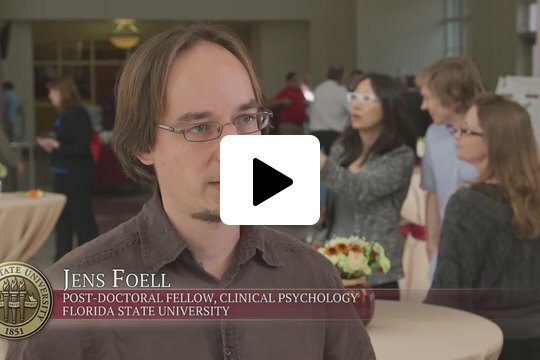 It’s been a busy fall semester and a very productive time for Florida State University. 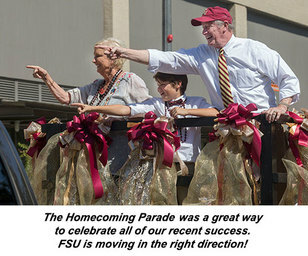 We already know that we are making strides in advancing FSU’s reputation as evidenced by our jump in the U.S. News & World Report rankings, and now a lot of things are falling into place that will help us continue on a clear path to greater national prominence. The Board of Trustees met Oct. 28 and approved our new five-year strategic plan, “The Future is Florida State.” I want to thank all of the Strategic Planning Committee members for their countless hours of work during this process, especially the committee co-chairs Provost Sally McRorie and Vice President for Finance and Administration Kyle Clark. The new strategic plan outlines FSU’s vision and goals for the next five years, and I encourage you to take a look at the final product. We think the plan captures an entrepreneurial spirit at FSU that has long distinguished it from other universities and provides a framework that will propel us toward the Top 25. With that goal in mind, we are requesting funding from the Legislature to hire more faculty to improve student-faculty ratio and retain current faculty. We’re also asking for more resources to expand research and boost student success. We’ve had some other exciting happenings in recent days as well. Last week, we officially broke ground on the new Earth, Ocean and Atmospheric Science building. By bringing the different disciplines from EOAS together in one building, we are providing a collaborative environment that we hope will enrich the research and educational opportunities for both our faculty and students. We are so grateful to the Florida Legislature for making this investment in Florida State. Last week, we also unveiled Florida’s most advanced MRI machine. Although it is located at the College of Medicine, it is open to students and researchers from all academic disciplines engaged in research on how the brain works. It’s hard to imagine a more important area of study than the brain, and this machine will open up a whole new world of research possibilities for our faculty. 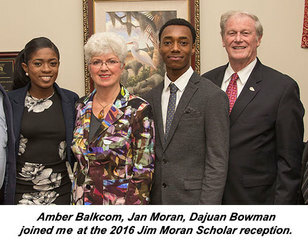 As you know, we are in the process of creating the new Jim Moran School of Entrepreneurship, thanks to a $100 million gift from Jan Moran and the Jim Moran Foundation. Earlier this month, Mrs. Moran visited campus, and she is very pleased at the progress that has been made to launch the school. The new school will be an integral part of our deepening commitment to continuous innovation — the first goal of our new strategic plan. Another goal of the plan is to realize the full potential of diversity and inclusion — a top priority for me. That’s why I’m so proud of the students who are leading the new #PowerOfWe campaign, which embraces our differences and promotes a culture of engagement. 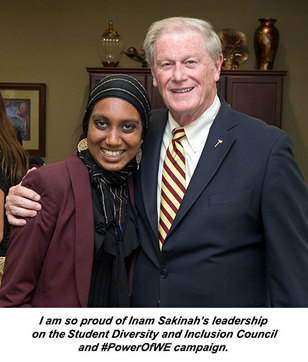 Inam Sakinah, chair of the Student Diversity and Inclusion Council and a Presidential Scholar, has been a driving force in this campus-wide effort. She gave an outstanding presentation to our Board of Trustees. FSU recently won its third consecutive Higher Education Excellence in Diversity (HEED) Award from INSIGHT Into Diversity magazine, the oldest and largest diversity-focused publication in higher education. That’s a testament to how committed we are to the values of diversity and inclusiveness. I also want to share how very impressed I was with our students at the President’s Showcase of Undergraduate Research Excellence in September. I know that many of you are helping mentor our undergrads in their research, and I want to congratulate you in this mission — their projects reflected the university’s longstanding commitment to nurturing well-rounded students. In a few days, our country will celebrate Veterans Day, which is also a great reminder of FSU’s strong commitment to support our student-veterans. We have so many activities going on surrounding Veterans Day. Whether you are enjoying the football or women’s basketball military appreciation games or are attending FSU’s Student Veteran Film Festival, please take a moment to thank a veteran for their service. There are so many great things happening on campus, and it is such an honor to serve as president of Florida State University. Next week, I will celebrate my two-year anniversary in this job, and I can truly say it has been the most rewarding experience of my life. Together, we have accomplished so much. I have incredible admiration for the work you do every day, and I have shared a few media clips that highlight your cutting-edge research below.